“You don’t have to be a wine lover to enjoy a holiday in a vineyard in Europe (but it helps), says Annabelle Thorpe” in The Times (Saturday, 11 August 2012). We were delighted to have our farmhouse at Château Bauduc included – see #6 below. Of course, we can’t repeat the whole article but for those of you who don’t subscribe to The Times, here’s the list with (1) how many each place can sleep, (2) the starting price and (3) contact and booking details. 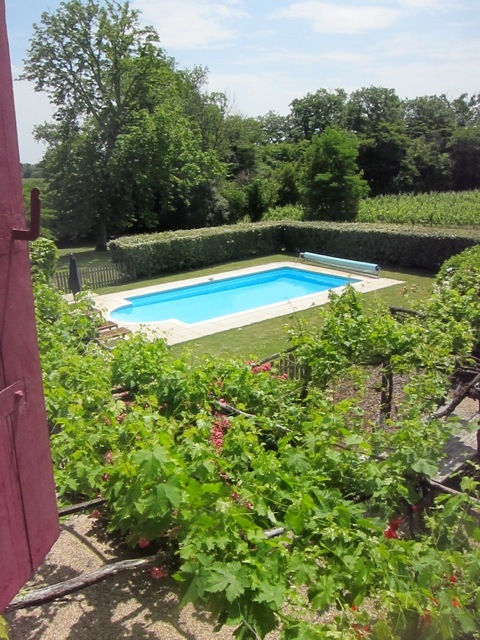 All the vineyards offer wine tasting, not surprisingly, and if you’re planning on staying in a sunny European wine region between May and September, go for a spot with a private pool. Essential after a hard day’s work tasting wines. We’ve taken the liberty of keeping the description of the farmhouse at Bauduc (pictured) in our shortened version below. The Times website doesn’t link direct to the other websites unfortunately, so you’ll have to do a bit of copying and pasting of domain names for more info. One final note. Only 5 out of the 20 can be booked direct, despite the time and care that goes into making each destination special. In this day and age, isn’t that a pity? From £390 per week through Holiday Lettings (holidaylettings.co.uk). From £352 for a week, book through Sawdays (www.specialplacestostay.co.uk) or direct on 00 33 3 85 51 16 11. From £1,150 per week with Vintage Travel (01954 261431, vintagetravel.co.uk). From £799 pp per week, based on ten sharing through S J Villas (020-7801 4010, sjvillas.co.uk). From £595 per week, (00 33 2 4757 1274, www.leclosdefontenay.com). From £945 per week (0800 316 3676, bauduc.com). From £221 per night for a barn house (00 33 4 67 00 00 67, www.lescarrasses.com). From £1,395 per week through Vintage Travel (01954 261431, vintagetravel.co.uk). From £2,556 per week (16 sharing) through Spain Holiday (020-3384 7066, spain-holiday.com). From £182 per night, through Chic Retreats (020-3397 0085, chicretreats.com). From £1,968 through Holiday Rentals (holiday-rentals.co.uk, ref 845598). From £278 per night for a one-bed villa, through I-Escape (i-escape.com). From £198 per week (based on two sharing), through Owners Direct (ownersdirect.co.uk). From £413 pp per week through C V Travel (020-7401 1010, cvtravel.co.uk). From £580 per week through Holiday Lettings (holidaylettings.co.uk). From £1,404 per week (00 39 583 97801, fattoriadifubbiano.it). From £761 pp (two sharing), including flights and car hire (020-8758 4722, sunvil.co.uk). From £567 per night (00 39 055 8074125, www.villacastellare.tuscany.it). From £1,466 per week, through Sawdays (sawdays.co.uk) or book direct (0039 0575 791166, casasingerna.com). From £2,855 per week through Owners Direct (ownersdirect.co.uk). Can you recommend any others? Feel free to comment below. Hi, It is really nice sharing but can you share some more images? These are now on my bucket list.